Common law recognises that although a promisee is entitled to contractual performance it will sometime be unreasonable to order damages assessed at the cost of rectifying noncompliance. This article describes the divergent responses of English and Australian common law to the question of when an award of rectification damages will be regarded as unreasonable. The House of Lords has held that damages are unreasonable if disproportional to the suffered loss. This kind of proportionality enquiry requires assessment of subjective experience of breach and subjective intention to reinstate. The Australian High Court’s response eschews subjective analysis and focuses instead on whether the breach discernibly detracts from the objectively determined purpose of the contracted performance. It is contended that the High Court’s doctrinally superior response has unfortunately been diluted by subsequent decisions at Australian intermediate appellate level – in particular, Stone v Chappel. 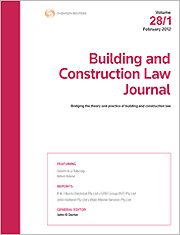 For the PDF version of the table of contents, click here: BCL Vol 34 No 3 Contents.